Composer Elizabeth Vercoe makes Rockport, Massachusetts her home. 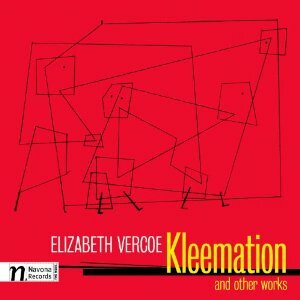 A goodly sampling of her chamber music is to be had on Kleemation (Navona 5884), including the title work, an hommage to the drawings of Paul Klee for flute and piano. They range from the solo flute piece, "To Music", through to a work for the larger massing of chamber ensemble and soloist: "Despite Our Differences #1", a high-water mark of the disk. Throughout Ms. Vercoe comes across as a composer with plenty of ideas, solid technical abilities and a do-it-yourself modernism that works well for her. "Irreveries from Sappho" brings in the influences of blues, ragtime and boogie-woogie piano styles and vocals that sound as if they weren't perhaps as concerned to come through with stylistic continuity as they might. Moreover the mezzo-soprano has a more pronounced vibrato than seems meet for this stylistic amalgam. It is incongruous in effect, ultimately, and not the best moment of the disk but it does not last long. Elizabeth Vercoe is a welcome voice in the modern music mix. Kleemation has some very attractive music on it overall, played decently to excellently.